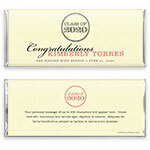 This clean, modern design is sure to be a hit at your graduation celebration! Design: Elegant date monogram with mixed fonts. Personalization: Front date, message and name, back title and message.